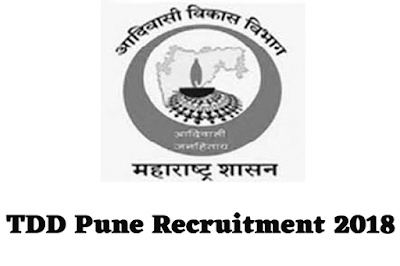 Tribal Development Department Pune Maharashtra has invited to application for Teachers posts. Eligible candidates who wants to apply for these posts refer the below article for details like age limit, qualification and how to apply for TDD Recruitment 2018. Age limit:- To get all the information related to the prescribed age for submission of application, see the departmental advertisement. Candidate H.Sc. D.Ed./B.A.B./B.Sc.B.Ed. (Through English) should be passed. Candidates should be from primary schooling, secondary education, higher secondary education and graduate education through English. Applications will be accepted as per the format attached to the advertisement only. Post the application form with all documents mentioned in advertising PDF before 07 December 2018.